Person-to-Person is a community-supported agency, and Darien has been an incredible supporter of Person-to-Person over the past 50 years. Ceci Maher, executive director of Person-to-Person, speaking in favor of the proposed checkout bag ordinance. Every year, we use about 100,000 bags. We have been enormously green. We recycle, we ask for people to give us recycled bags, and we use them. And then clients bring them back sometimes — and mostly, not, but sometimes — and we reuse them again. We are in support of this ordinance. We really believe in the environment, and that’s one reason we are tremendously green. We reuse clothes, as you all know. We reuse bags. When we do the postal food drive, we have people who fold up all those bags, and we use them again. Even though a 100,000 bags is going to be very difficult for Person-to-Person, because they are expensive — I’m not saying they aren’t. We are working with Skip the Plastic and BYO to make sure that we are getting at least a start. And we’re going to be putting information in our database so every time a client comes gets a reusable bag, we’ll mark it and ask them to bring it back, and if they don’t bring it back, they another try, and then if they don’t bring it back, they’re going to have to figure something out. So we’re committed to it, we’re planning for it, and we’re in support of it. My name is Joe Warren […] and I have been here in Darien forever. I also happen to own a retail store on Heights Road here in Darien, and I use both plastic and paper bags, and to be very honest with you, I couldn’t care less whether this ordinance gets passed or not. My problem is, this ordinance does not address the problem. It is simply a Band-Aid solution for what we perceive is a big, big problem. There is a problem. The problem is not at Palmer’s, it’s not at Stop & Shop — it’s in Bridgeport. I refuse to accept that answer. Second of all, the issue of plastic — single-use plastic bags are just a drop in the bucket. They’re not the fundamental problem. The only problem with them is that Bridgeport won’t recycle them. They burn them, instead. We need to correct the problem at the source. If we’re serious about removing plastic from the stream, we need to look at things like those silly tabs on the milk cartons that nobody recycles. People pull that tab out of the milk carton, throw it in the garbage, and who cares where it winds up. And that’s by the thousands. We don’t need it at all! Why they put that on the milk cartons and the juice cartons is completely beyond me. We were fine when we just simply opened the side of the carton and formed a pour spout. If we’re going to address this problem, this ordinance is not the way to do it. We have to address the problem on a much larger scale. 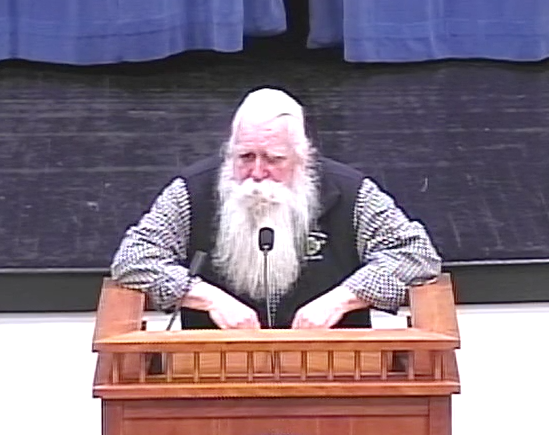 Yes, we in Darien can begin the process, but we have to look at a bigger, bigger picture. I live at 23 Catalpa Terrace. Twenty-nine years ago I co-founded the Darien Environmental Group. The mission of the group is to educate Darien residents about ways in which they can change their consumer and lifestyle habits to benefit the environment. Retailers enthusiastically displayed these signs. This was 29 years ago — and yet, here we are, still talking about, but not acting on, this issue. Still holding: Lynn Brooks and one of her 29 veteran reusable bags. Another effort involved offering recyclable shopping bags, at cost, to Darien residents. I purchased 10. This is one of those bags — 29 years later! And still in use! If you multiply my 29 years of grocery shopping with these reusable bags, times 52 weeks per year, times (conservatively) five bags of groceries per week, I have personally removed 7,500 bags from production and waste stream. One person; 7,500 bags. I implore you to approve the ordinance for management of plastic and paper checkout bags as soon as possible. 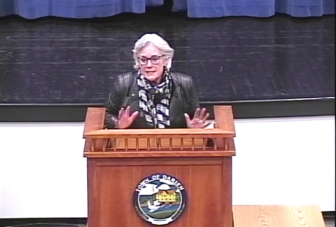 RTM Hearing on Plastic Bags 2-6-19 from Darien TV79 on Vimeo. BYO Darien, the local group advocating for the proposed ordinance restricting plastic and paper carryout bags, has put together this description of the proposal for Darien residents and businesses. The Representative Town Meeting will receive written emails about the proposal through Friday, March 1 (details below). 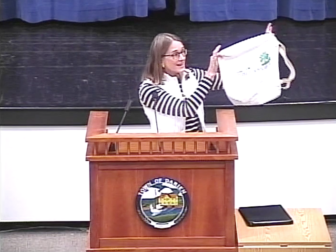 The public is invited to speak about the specific draft proposal for a Darien bag ordinance restricting use of plastic bags at a Representative Town Meeting pubic hearing at 8 p.m., Thursday in the Town Hall Auditorium. "If you wish to speak how this will affect your business, it is important you attend and speak," the Darien Chamber of Commerce recently told its members in an email.